Minneapolis police officer Efrem Hamilton's attorney on Tuesday badgered a state's witness who concluded that Hamilton was not justified when he fired his gun into a car full of people in 2016. 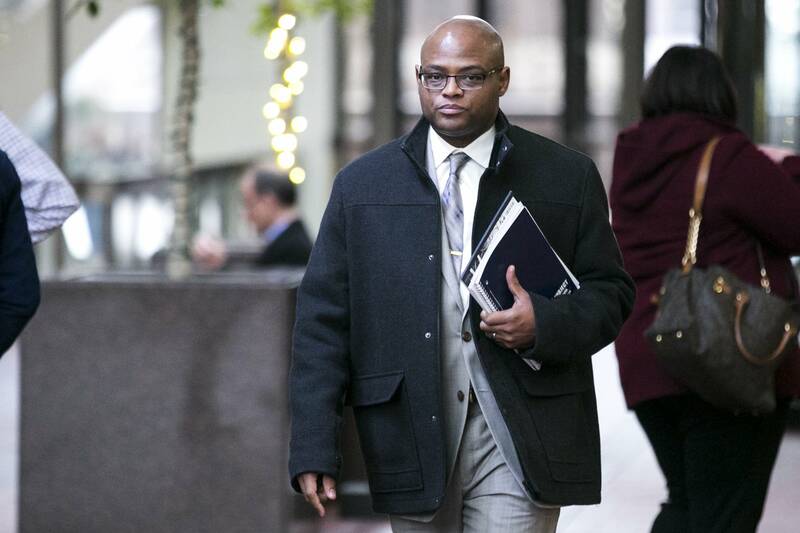 Before prosecutors rested their case, Attorney Fred Bruno challenged ex-Minneapolis police officer Mike Quinn's educational background, experience on the force and his conclusions about Hamilton's decision to fire at a car that had just backed into him. Hamilton faces three felonies from the incident. Quinn joined the force before the state required officers to have a law enforcement degree. And Bruno questioned whether Quinn was aware of new developments in use of force training since he left the force more than 20 years ago. Bruno particularly took issue with assertions Quinn made on the stand Monday about what he called a "code of silence" which prevents officers from holding others accountable. The subject came up after assistant Hennepin County Attorney Tara Ferguson-Lopez told Judge Fred Karasov she was concerned that three officers who testified, including the lead investigator on the case, "altered" their testimony. Ferguson-Lopez said it appeared the officers' testimonies at trial were more favorable to Hamilton than statements they made in the past. Bruno asked Quinn if he had any statistical evidence to support his claim that "all police officers subscribe" to the code. Quinn answered that he didn't know if all officers practiced the code, but he said all officers are affected by the code. And he said he reached that conclusion based on his own experience as well as conversations he's had with officers from around the country. Quinn acknowledged that he is no longer a certified use of force instructor. And he said he left the force before officers started carrying tasers or body cameras. But he said state law pertaining to force hasn't changed. Bruno questioned Quinn about an anecdote from "Walking with the Devil," Quinn's 2005 self-published book about his experiences on the Minneapolis police force in which Quinn explains how the police "code of silence" led him to write a false police report. "You were part of the very thing you're criticizing today," Bruno asserted. Quinn later explained that as a young cop, he was pressured to look the other way after he observed officers steal sporting goods equipment from a warehouse. He admitted that he filed a burglary report which neglected to note that the officers had stolen the goods. Quinn said at the time he didn't want to lose his job. He also said had he "ratted" on his colleagues he would have been ostracized and he feared officers would retaliate against him by not backing him up on a dangerous call. Bruno also appeared to poke a hole in one of the conclusions from the report Quinn prepared for his testimony. Quinn had testified that after reviewing the squad and body camera video, Hamilton fired before the sound of an engine revving. Bruno played several body camera videos in which the revving sound is heard before the single shot rings out. At first, Quinn said the rev and shot occurred simultaneously. He later modified that assessment to say the engine rev came slightly before the shot. The sequence of sounds is apparently a critical part of Hamilton's defense. Bruno has said that Hamilton fired because he believed the BMW that backed into his squad was revving up its engine to hit him again. Quinn said he didn't believe the engine sound came from that car. Regardless of when the engine revved, Quinn said it had no bearing on his conclusion that Hamilton did not need to use deadly force.